ROB BLAKE JERSEY RETIREMENT: In the second installment of a multi-part series covering the retirement of former Kings defenseman Rob Blake’s jersey number 4 on January 17, current Kings players spoke exclusively with Frozen Royalty about the jersey retirement, and about Blake’s impact on the team and the game of hockey. the team’s 2014 Stanley Cup Championship Rally. EL SEGUNDO, CA — With the retirement of former Los Angeles Kings great Rob Blake’s jersey number 4 on January 17, as you might guess, the local media have been buzzing around the team’s practice facility in El Segundo, California, asking about Blake. But if you look at the roster, only two players actually played with Blake, center Anze Kopitar and forward Dustin Brown, who both played with Blake during the 2006-07 and 2007-08 seasons. 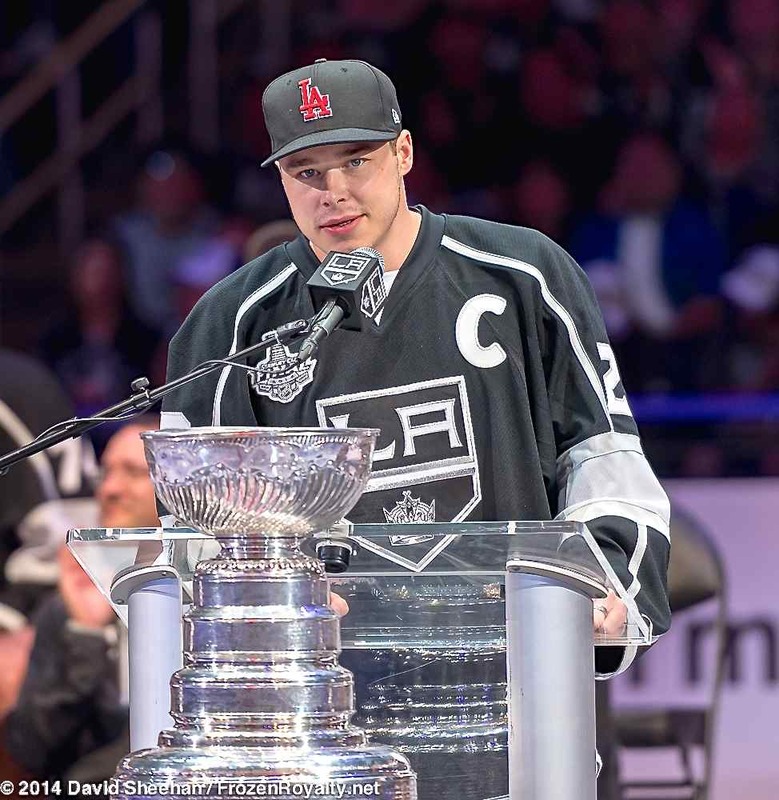 Brown stressed that there is probably no one more deserving of having his jersey number retired by the Kings, and much of that is because of the player and person that Blake was, and still is. On occasion, Brown has taken a cue from Blake in that regard, having to speak on behalf of the players to the coach or management. Veteran defenseman Robyn Regehr shared a perspective from the outside looking in. Although Regehr is not an offensive defenseman, there are parts of his game where he has applied what he has learned from watching Blake. Blake stood out among defenseman because so very few have ever possessed all the weapons he had—size, strength, huge hitter, decent speed and skating ability, a hard, heavy shot, a solid, fierce defender with a long reach, a good first pass, and off-the-charts hockey sense. Today, there is no player who has all the gifts that Blake had, although one comes fairly close. As Brown mentioned, Blake was never a player who sought notoriety. He shied away from the spotlight—he was always a team guy, and that is still apparent today. “If you know him at all, he’s one of those guys who doesn’t want the attention,” said Brown. As the Kings’ assistant general manager, Blake’s experience has been invaluable. Although rookie defenseman Brayden McNabb has not been in the Kings organization for all that long, Blake has already made an impact on how he plays the game. Regehr could not stress enough how important that kind communication is for a National Hockey League team. Blake’s ability to help players doesn’t end with the youngsters.